Giants left fielder Angel Pagan body-slammed an animal rights activist clutching white paper flowers, who ran onto the field into the outfield grass at AT&T Park during the fourth inning against the Los Angeles Dodgers on Friday night. The tackle, caught on camera, went viral. On Saturday, Wayne Hsiung, who landed in a heap beneath Pagan, said he is member of a Berkeley-based group called Direct Action Everywhere. Hsiung said he rushed the field in an attempt to bring attention to animal violence allegedly perpetrated by Farmer John, the company that supplies Dodger Dogs — the famous hot dogs served at Dodgers Stadium. A woman -- identified as Ashley Sloan, also an animal rights activist -- was taken down by security in shallow right field. The two, dressed in Dodger Blue, were removed. "We had ten white flowers to represent the 10 billion animals that are tortured and killed every year in the United States," Hsiung said. "I have no doubt that if these were dogs or cat or frankly, even if they were pigs, that Americans actually got to meet and know on a personal level that the entire world would stop and say, 'Lets end this.'" For his part, Pagan said Friday that he realized he had to do something to slow Hsiung down, unsure whether there was any motive to harm a player. "I was just trying to protect myself and protect my teammates," he said. "The guy was getting closed to my teammates. I guess it was very explosive. Us athletes, we've got that kind of strength. ... It worked." Hsiung first approached catcher Buster Posey, who with his left arm shoved the man to the ground. The man jumped up and ran and third baseman Gordon Beckham swiped at him before he took off into left field. Pagan offered a hand as if to accept the flowers before throwing both arms around Hsiung, twisting him and throwing him to the ground. According to Hsiung, Pagan is a "pretty strong guy." "I’m a pretty fit fellow myself," he said. "I run and work out every day. And he picked me up and tossed me over like a rag doll." Holding Hsiung down until security reached him, Pagan received a roaring ovation from the sellout crowd when the half-inning ended and tipped his cap. 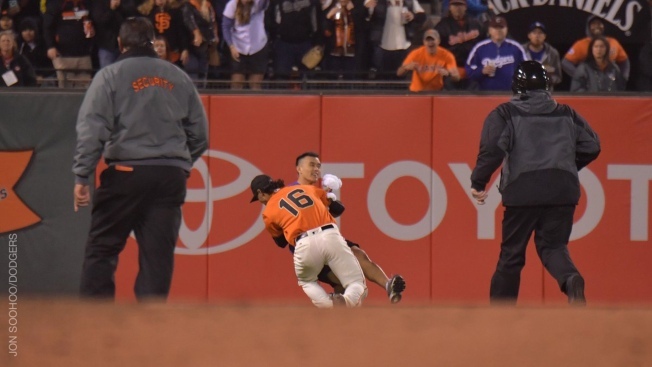 First baseman Brandon Belt weighed in with: "Angel's tackle of the guy was one of my top moments in baseball history. That was pretty funny."